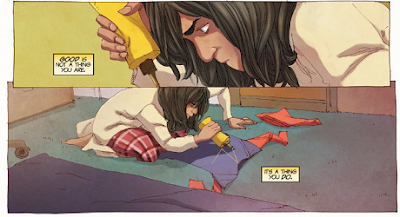 Ms Marvel made it onto my radar for being the first superhero comic whose protagonist is a young Muslim woman. 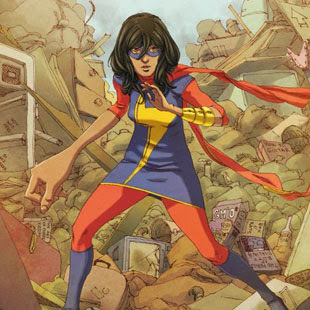 Kamala Khan is a Pakistani-American teenager from Jersey City who unexpectedly develops super powers, and the first story arc is all about her coming to realise it’s okay to be Ms Marvel and still be herself, in all her multilayered glory. I loved Kamala from page one. She’s dorky and adorable and funny and smart, and like thousands of teenagers all over the world, she occupies and moves between different cultural spaces with ease. 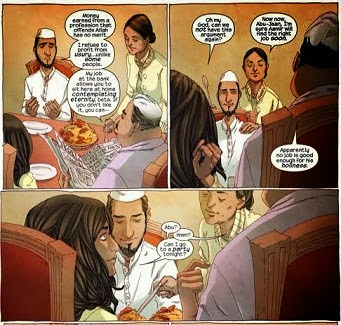 Kamala writes fanfiction about her favourite superheroes and wants to go to parties and be seen as “normal”; she also cares about her family and goes to Sheikh Abdullah’s Saturday youth lecture with her friend Nakia. As No Normal unfolds, Kamala realises that there’s nothing inherently incongruous about these things. It’s okay to be complex and to claim the space to be everything that she is. It’s the idea that superheroes can’t be Pakistani-American girls from Jersey City that needs fighting, not any part of her. 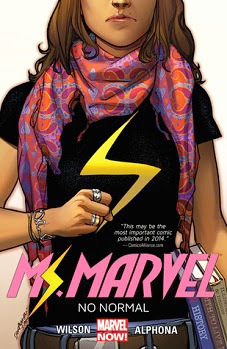 Although I’ve been reading comics for a good while, I’m a complete superhero newbie; part of me was therefore worried that my lack of familiarity with the MCU would make Ms Marvel difficult to get into. Friends, I needn’t have worried. Kamala was the perfect guide to this universe: although her story unfolds against a larger narrative backdrop, it was personal enough that it was easy to feel invested right away. Also, as a new superhero, Kamala made it seem like it was okay for me to develop my understanding of her universe and its rules page by page, plus her geeky nature and sense of humour appealed to my sensibility and made me feel at home. I’ve had a couple of awkward experiences with pieces of media that were recommended to me as perfect entry points to complicated narrative universes, but which I unfortunately found confusing and inaccessible. It was a relief, then, to find Ms Marvel as welcoming as advertised. I can’t wait for the second trade paperback to come out next year. Good is not a thing you are. It’s a thing you do. Goodbyebird was 100% not kidding about this book “[mashing] your face straight into awesome ladies and female mentor-ship”. 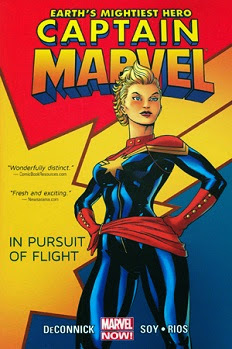 For the first few pages I felt that perhaps Captain Marvel required a bit more background knowledge than Ms Marvel, but I was fine as the story progressed and became about time-travelling; women pilots in WW2; the Mercury 13 program; smart, capable, ambitious women struggling against gendered constraints in a historical setting; and placing a complex relationship between two women front and centre. In short, it was totally my sort of thing. I probably shouldn’t have been surprised that there was so much for me here, but because part of me was still expecting to feel at a loss I kind of was. I’m sure there’s a lesson in here somewhere. 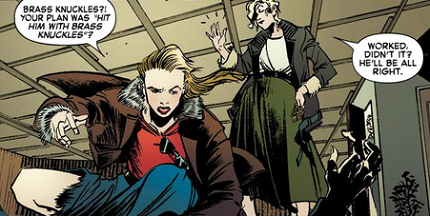 Kelly Sue lets Carol settle into historical context. 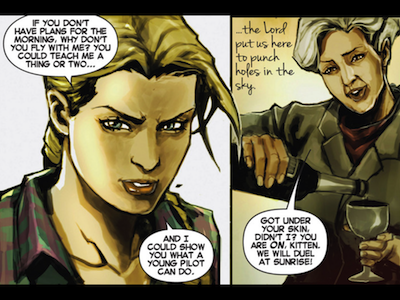 Helen was more than able, but Carol was the first generation that was allowed and that complex knot of admiration and tension between the two women is subtly played and rife for exploration in future issues. I love it when women mentor other women in the stories I read, and it’s even better when that relationship is both beneficial and flawed. It’s compelling and it’s human, and it doesn’t need to focus on men to achieve that. 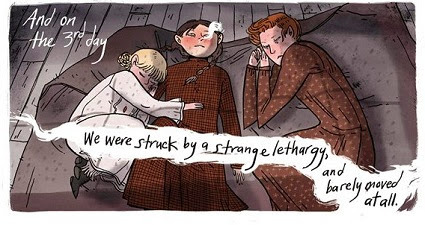 Emily Carroll’s collection of Gothic stories is nightmare-inducing in the best possible way. 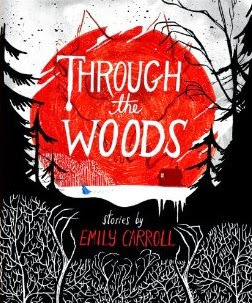 The title couldn’t be more apt: these are stories set in dense, mysterious forests, drawing from the tradition of the darkest fairy tales. Comparisons to Angela Carter are difficult to avoid — what Carter accomplishes with her exuberant use of language, Carroll does with colours. I was especially taken with the way she employs darks and reds to create the perfect atmosphere. Through the Woods is full of untidy endings that leave questions lingering and refuse to settle the tension her stories raise. When I went to see Sarah Waters discuss the Gothic tradition recently, she said that this lack of resolution and the way it lingers in your mind is one of the hallmarks of Gothic fiction. Through the Woods accomplishes that better than anything I’ve read in a long time. 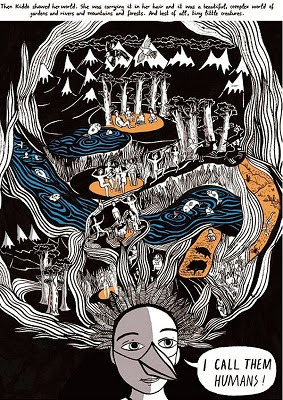 When trying to describe this comic, there’s one sentence that keeps popping into my head: “It’s like a Nick Cave song”. 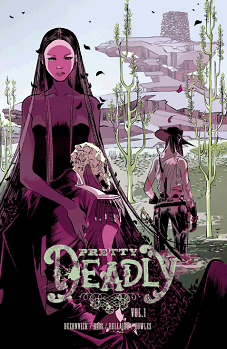 If you ever thought it might be fun to read a horror/western crossover featuring interesting women, then Pretty Deadly is the comic for you. 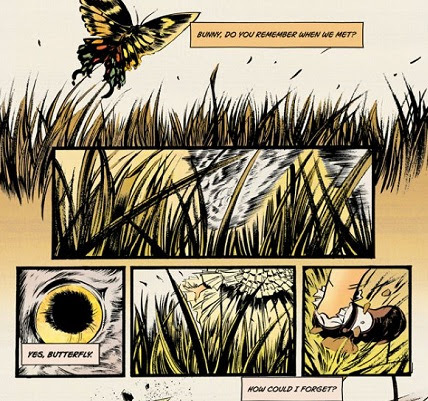 The story is narrated by the haunting voices of Butterfly and Bones Bunny, and their tone is reminiscent of old folk tales. It’s really no wonder I was hooked straight away. 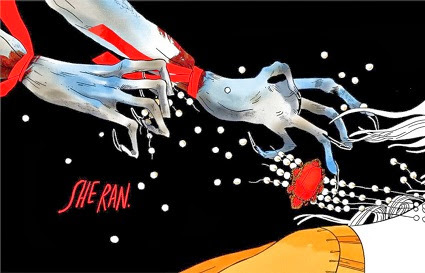 Pretty Deadly is dark and eerie and occasionally terrifying. The mood of the story reminded me a bit of Bayou, though the two are thematically very different. You could describe it as the origin story of Ginny Death, Alice and Sissy; if I have one complaint, it’s only that the first five issues spend a long time setting up a story that is then resolved rather hastily. I want to see the women Pretty Deadly introduces so skilfully go on to do interesting things. It seems that the comic is currently on hiatus, but I hope we’ll see more volumes in the future. 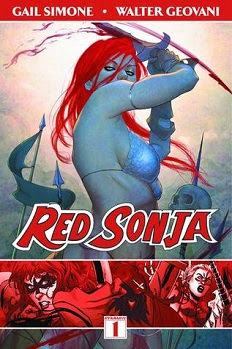 Red Sonja was another Comics and Super Women Week recommendation. I was advised to look past the chain mail bikini Sonja wears on some of the covers, and I’m glad I did. Gail Simone, whose stuff I’d been meaning to try for ages, never hypersexualizes her protagonist or reduces her to a stereotype. Instead, we get a messy and complicated sword and sorcery heroine who occupies the kind of space normally reserves for male characters. 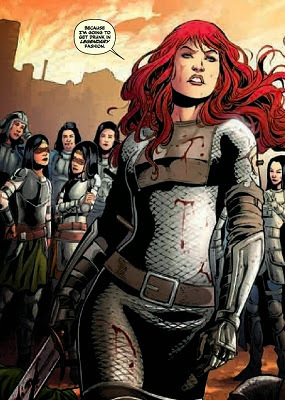 Sword and sorcery has never been my favourite subset of fantasy, and Red Sonja: Queen of Plagues never pretends to be anything other than what it is. On the other hand, I do like stories that deconstruct certain aspects of a genre while staying within its storytelling conventions. Terry Pratchett’s Cohen the Barbarian is a good example of this, and so is Red Sonja. I enjoyed Simone’s determination to allow women to occupy grey areas; and also the fact that, unlike what you might think at first, this isn’t a story that sets two women against each other but rather one that shows patriarchal power at work. 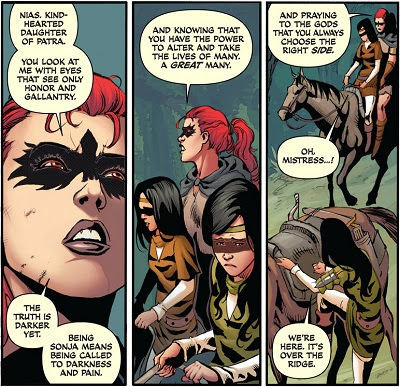 Red Sonja wasn’t closely aligned with my interests in the same way Ms Marvel and Captain Marvel were, but I’m glad I gave it a chance anyway. I loved this book so much. 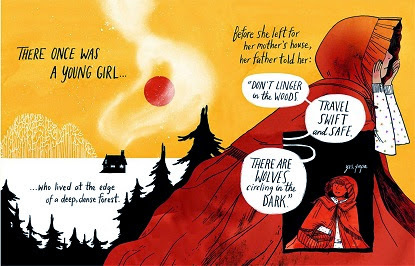 I think I first added it to my TBR list when I started seeing it listed among last year’s best graphic novels — in typical fashion, it took me a whole year to get around to reading it. 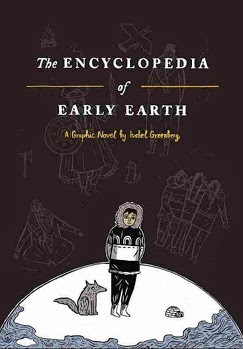 The Encyclopedia of Early Earth is a series of stories nested within each other, following a central character known as The Storyteller as he goes on a quest for a missing piece of himself (there’s a story to go with that), tells his stories to the people his travels introduce him to, and hears theirs in return. The different parts of the book are modelled on different world mythologies, and the overall framing story is like a myth itself. There’s an uncaring god, Birdman, and there are his two children, the ravens Kid and Kiddo, who take a considerable interest in our hero and his journey. All of the above is more than enough for a reader like me, who loves mythology and stories within stories, to fall for The Encyclopedia of Early Earth. But what really makes this book stand out is Greenberg’s narrative voice, to which I’m not sure I can do justice. It’s savvy, humorous, metatextual and full of warmth, and it was the best thing about a book I’d have a hard time not loving anyway. When did Captain Marvel become a woman? That's so awesome! So many of these look so good. I'm going to have to get my hands on them! I put The Encyclopedia of Early Earth on my wish list immediately upon reading about it - it sounds right up my alley! Thanks for bringing it to my attention. What an awesome list! Ms. Marvel was already on my wish list but the rest of these obviously need adding on as well. But whyyyyyy is Pretty Deadly on hiatus? 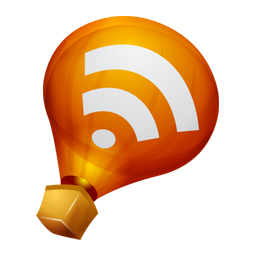 I only just learned that it existed, and I was all excited for it, and already it is not being published currently. Jenny: I don't know D: I wanted more but my hopes were crushed. And yes, they're unbelievably prolific! Marisa, I'm confident that you'll like them :D Do let me know what you think! I was sure I'd commented on this post, but then I remembered I'd read it on mobile and promised myself I'd come back and comment later. Which I did not do, except insofar as right now counts as later. Anyways: hurray for comics by women! I looooooved Kelly Sue Deconnick's original run on CAPTAIN MARVEL, and I can't wait until it's my turn to read the first arc of the new series. 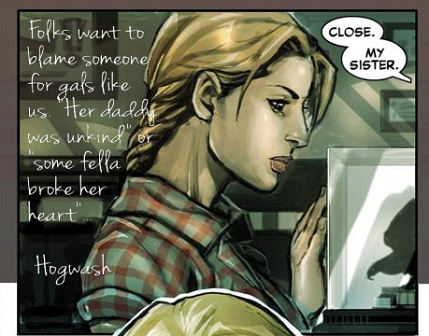 I have such a friend-crush on Carol Danvers and Jessica Drew. I want to be BFFs with both of them. 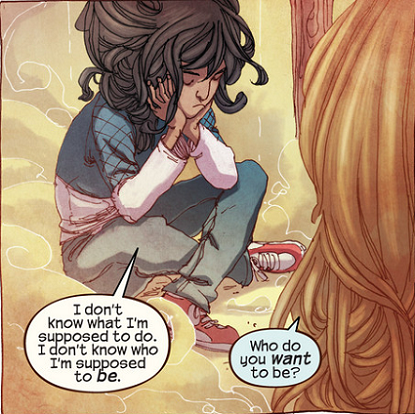 I can't wait to meet Kamala Khan, too. The two people who were hoarding NO NORMAL have finally returned it, so I'm hoping I'll quickly rise to the top of the library list now. And PRETTY DEADLY! Oh, how I hope my library buys it. It looks wonderful.